This feature, however, makes mobileAgent all the more use. 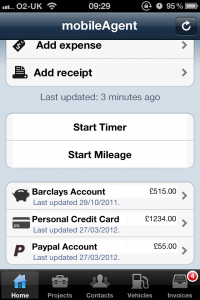 mobileAgent has shown the current bank account balances for a long time, but if you have the Barclays feed setup, they will be up to date, without you having to do anything except sync your phone. It's a great way to check on your account balance quickly. I'm planning on a few changes soon to mobileAgent, including using their new API (which released yesterday, too!). One of them is most likely to be showing the last few transactions in your bank account, and possibly background updates for some of the data which changes often - eg bank account info. Grab mobileAgent from the AppStore.